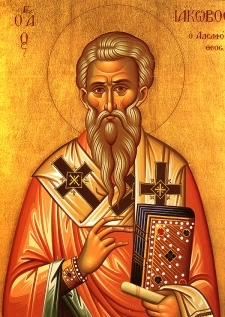 Saint James the Just, also called James Adelphos and James the Brother of Our Lord (died AD 62), was the first Bishop or Patriarch of Jerusalem. According to the Protoevangelion of James, James was the son of Joseph—along with the other 'brethren of the Lord' mentioned in the scripture—from a marriage prior to his betrothal to Mary. He wrote an epistle which is part of the New Testament. St. James is commemorated on October 23; on December 26 and also on the first Sunday after the Nativity, along with David the King and St. Joseph; and on January 4 among the Seventy Apostles. Eusebius, quoting from Hegesippus, writes that James was "called the Just by all from the time of our Savior to the present day; for there were many that bore the name of James." He is called Adelphos (Greek "brother"). Jesus's 'brothers'—James as well as Jude, Simon, and Joses—are mentioned in Matthew 13:55, Mark 6:3, Luke 6:14, and by Paul in Galatians 1:19. Paul further describes James as being one of the persons the risen Christ showed himself to (I Corinthians 15:3-8); then later in I Corinthians, mentions James in a way that suggests James had been married (9:5); and in Galatians, Paul lists James with Cephas (better known as Peter) and John, as the three "pillars" of the Church, and who will minister to "the circumcised" (that is the Jews) in Jerusalem, while Paul and his fellows will minister to the Gentiles (2:9, 2:12). Acts provides clear evidence that James was an important figure in the Christian community of Jerusalem. When Peter, having miraculously escaped from prison, must flee Jerusalem, he asks that James be informed (12:17). When the Christians of Antioch are concerned over whether Gentile Christians need be circumcised to be saved, they send Paul and Barnabas to confer with the church there, and it is James who utters the definitive judgment (15:13ff). When Paul arrives in Jerusalem to deliver the money he raised for the faithful there, it is James to whom he speaks, and who insists that Paul ritually cleanse himself (21:18). A debated passage, often characterized as a Christian interpolation, in Josephus' Jewish Antiquities, records his death in Jerusalem as having occurred after the death of the procurator Porcius Festus, yet before Clodius Albinus took office (Antiquities 20,9)—which has thus been dated to AD 62. The high priest Ananus took advantage of this lack of imperial oversight to assemble a council of judges who condemned James "on the charge of breaking the law," then had him executed by stoning. Josephus reports that Ananus' act was widely viewed as little more than judicial murder, and offended a number of "those who were considered the most fair-minded people in the City, and strict in their observance of the Law," who went as far as meeting Albinus as he entered the province to petition him about the matter. Their agitations led to Ananus being deposed as high priest. Eusebius, while quoting Josephus' account, also records otherwise lost passages from Hegesippus (see links below), and Clement of Alexandria (Historia Ecclesiae, 2.23). Hegesippus' account apparently varied from what Josephus reports: the Pharisees, upset at St. James' teachings, first threw him from the summit of the Temple in Jerusalem, then stoned him, and at last broke his skull with a fuller's club. The Protevangelion of James (or Infancy Gospel of James), a work of the 2nd century, also presents itself as written by James. As a hierarch, you have the power to intercede. Pray to Christ God that our souls may be saved. And a faithful steward of the spiritual Mysteries. Therefore, we all honor you, O Apostle. "The martyrdom of James, the brother of the Lord" Quotes from lost writings of Hegesippus in Eusebius. This page was last edited on October 22, 2012, at 16:05. This page has been accessed 115,705 times.